This is a dish that brings back a lot of great memories of times spent with my great buddies in Hyderabad.. I remember getting excited the day I first read the name of this dish on a menu and the name was so intriguing.. I had to order it!! When it arrived.. It was this long big green Dosa stuffed with spicy chutney powder and Upma served with with a sweet and spicy ginger chutney.. It was a explosion of flavors!! Loved it then and Love it now. Thanks to Prathi, Swetha and Harsha for all the great culinary experiences in Hyderabad!! This dish is dedicated in memory of the fantabulous fun we had together !! The Upma I ate in Hyderabad was definitely not Oats Upma it was the Rava based one but I swapped it for a healthy twist. The last time I had Pesarattu was when my friend Mahi made these during a trip to the US! It was great surprise.. Missing the Pesarattu and the Putharekulu from Andhra! Grinding the batter: Grind all the ingredients together adding water slowly, till the batter becomes a semi-coarse pancake batter in a blender. Heat a flat pan in medium - high flame. Once the pan is hot, scoop up about 1/2 cup of batter with a round bottom ladle or a smooth round cup. Pour the batter to the center of the pan and using the smooth bottom surface of the ladle or cup, spread the batter outwards in a clockwise motion to make a pancake. Allow the pancake to cook in medium flame till it crisps up and the batter starts drying up. Now use a flat spatula like the one you would use to flip your omelette and flip your pancake. Allow it to cook for a minute or until it slightly starts turning color and becoming brown. Flip the pancake once more and immediately fold it and remove it for the pan. The green lentil pancakes are now ready to be made into a MLA Pesarattu. Grind the batter as smooth as you can. It's ok if it is not a very smooth paste and is slightly coarse. How to assemble the MLA Pesarattu? Open the pancake (a.k.a dosa) and sprinkle Chutney powder generously over it, then add around 1/4 to 1/2 cup of upma in the center of the pancake. Sprinkle some chopped onion over the pancake and they are ready to serve with some ginger chutney. The Oats upma and the chutney powder recipe will follow soon on the site...Stay Tuned and Follow us! 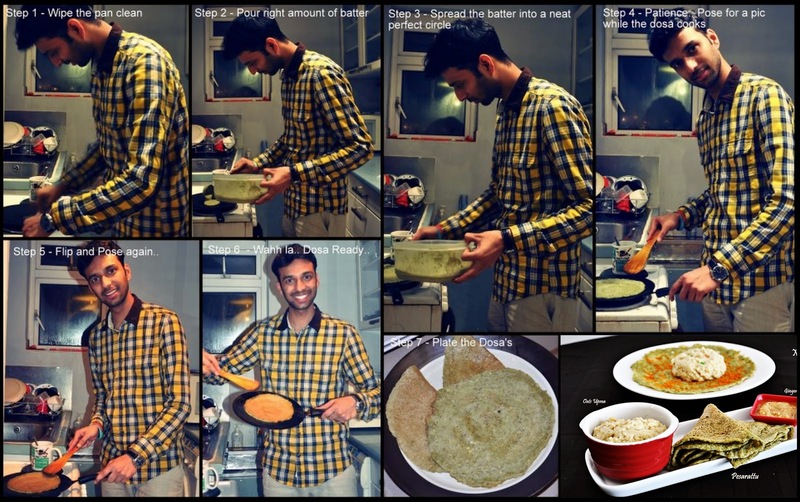 Step-by-Step Instructions to make the pancakes by our friend Piyush... His first time at making these and he made them like a pro..